For marketers and businesses, Google Maps is an extension of SEO. For businesses whose customer base is primarily local, Google Maps may be a more important source of traffic than traditional organic SEO or pay per click marketing. Lawyers, doctors, hotels and restaurants are all examples of businesses that need a presence on Google Maps to stay competitive. Google maps is an aspect of what is called “universal search”. Google maps attempts to identify businesses close in location to the searcher. If I need a lawyer and search for “lawyer” or I want a pizza and I search for “pizza”, it is likely that a business down the street will be much more relevant than a lawyer in New York or Ukraine. For certain searches, local results are better. How does Google know I want a Local Business? 1)	The search phrase must contain a city name: e.g, San Diego Lawyer, Surgeon in Minneapolis, etc. 2)	The search is for a business-related item. You can’t just search for “San Diego X” or “X San Diego”. X has to match a database of words. Lawyer, surgeon, pizza, hotels are all business-related, so Google-Maps triggers if you enter one of these phrases. “San Diego Rattlesnake” does not trigger Google Maps. Submitting your business to Google Maps can help you gain visibility when people perform these “local searches”. 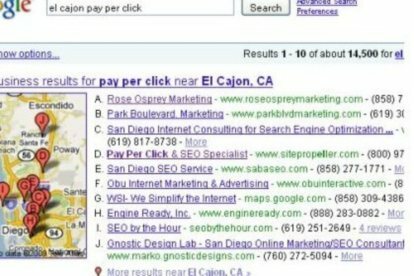 If people see you on Google Maps, they could clickthrough to your website and end up as customers. This has to be the easiest search optimization technique to use to help market your business. Obviously, the “trick” is to do it right. You only get seen if you are in positions A-J (the top 10). Google has not resigned to the fact that Google maps is the domain of marketers. As such, they have enforced very strict rules against attempts to optimize Google Maps. More than any other area of search marketing, it is better for you to be conservative- no keyword stuffing. Submit a map, or hire someone to submit a Google Map for you. If you still desire more visibility, and wish to be aggressive in your marketing, look into altering your SEO and PPC efforts.